After months spent running the world on her Mrs. Carter Show World Tour, Beyonce finally wrapped the tour in Portugal on Thursday evening. The Grammy-winning singer kicked off the concert series last April in Serbia, making her final stop at Lisbon's MEO Arena, and breaking down onstage when she spoke to fans about her time on the road. "I want a [spotlight]. I want them to see me. If you all don’t know, tonight makes 132 shows," Beyonce said, getting emotional as she addressed the crowd. 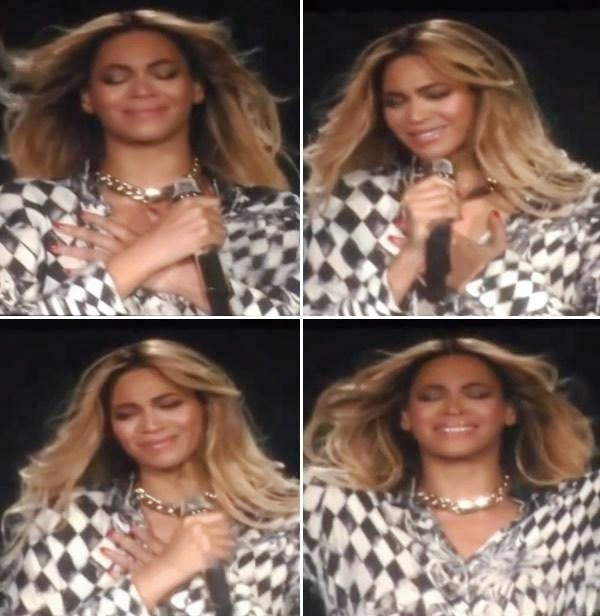 "Tonight is the last show of the Mrs. Carter Show. We started a year ago and I want to say this has been such a journey." In the year since Mrs. Carter hit the road for her tour, she released her surprise, platinum-certified self-titled album, celebrated her fifth anniversary with her husband Jay Z and made stops in four continents, selling out shows in major cities across the globe. "In the past year, we’ve been through so much together," the singer continued. "The Super Bowl, shooting the videos, all of these shows. When I first started the tour, my baby was not even walking yet." "I just want you to know that I am so lucky," Beyonce said, beginning to cry. "I’m giving y’all an ugly cry. Thank y’all again. Thank you for allowing me to have a career. And when I fall, you lift me up. When I’m hungry, you feed me. And I just want to give you my light. I dedicate this song to you guys."